2013 was an exciting first year for the Campaign to Stop Killer Robots. As we return from the holidays and get started on 2014, it is helpful to take a quick look back at 2013 to see how far we’ve come. 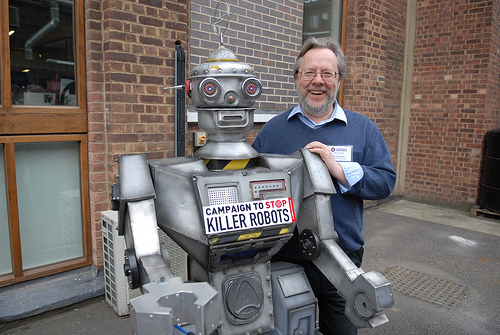 The Campaign to Stop Killer Robots was launched in April 2013 in London. Mines Action Canada is a co-founder of the campaign and a member of its Steering Committee along with other disarmament, human rights and humanitarian organizations. In May, the first Human Rights Council debate on lethal autonomous robotics followed the presentation of a report by the UN special rapporteur, Christof Heyns, on extra-judicial killings. During the debate 20 governments make their views known for the first time. A University of Massachusetts survey of 1,000 Americans found a majority oppose fully autonomous weapons and support actions to campaign against them. In August, the International Committee of the Red Cross issued a “new technologies” edition of its quarterly journal. The journal included articles by campaigners on fully autonomous weapons. During the UN General Assembly First Committee on Disarmament and International Security in New York in October, 16 governments made statements on killer robots. Also in October, campaign member the International Committee for Robot Arms Control launched a letter from over 250 roboticists, scientists and other experts calling for a ban on autonomous weapons. Mines Action Canada (MAC) welcomed this historic decision to begin to address this issue. MAC encouraged all states to pursue an international ban on these weapons to ensure there will always be meaningful human control over targeting decisions and the use of violent force. We were also pleased that Canada made its first public statements on this topic during the CCW joining the other 43 nations who have spoken out on fully autonomous weapons since May. “ If we have learned anything from the Canadian led efforts to ban landmines, it is that the world cannot afford to wait until there is a humanitarian crisis to act. We need a pre-emptive ban on fully autonomous weapons before they can cause a humanitarian disaster,” said Paul Hannon, Executive Director, Mines Action Canada in a press release. Our colleagues around the world have also seen exciting developments in their countries. The international campaign has put together a global recap. Canada does not have a national policy on autonomous weapons. There are many reasons why Canada needs to have a policy on killer robots as soon as possible. This year, MAC looks forward to working with the Government of Canada to develop a national policy and to work towards an international treaty banning killer robots. You can take action in 2014 by signing our Keep Killer Robots Fiction petition, by sharing the campaign website www.stopkillerrobots.ca and by donating to this new campaign.